The spiral is a symbol of eternity reflecting the universal pattern of growth and evolution. 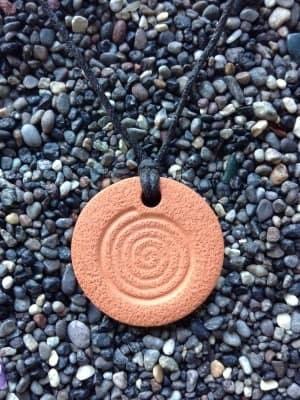 Found in all ancient cultures, the spiral has pride of place and many meanings attributed to it such as the journey through cycles of birth, death and rebirth, the cosmos, the expansion of consciousness, the goddess, the life force energy and the oneness of the soul. Wear the spiral to remind yourself you are a soul having a human experience; you are eternal. The Spiral Pendant measures 2.8 cm (1 1/8 in) across.